Two Wheel Oklahoma is a television travel show featuring the motorcycle journeys of Brad Mathison and Rex Brown throughout the Sooner State. 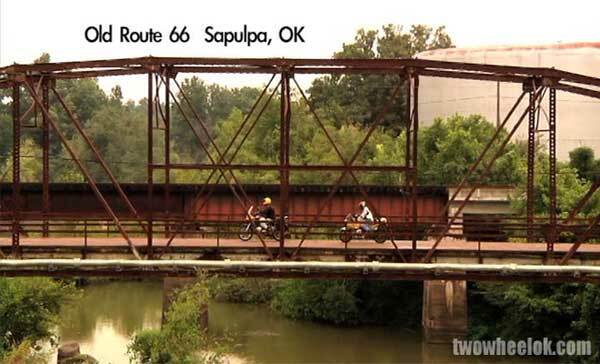 We started our television journey on a rusty bridge outside of Sapulpa, Oklahoma. That bridge, and the bumpy stretch of concrete leading west, is part of a very old roadway that predates Route 66. That first episode, originally aired April 2010 on OETA, introduced viewers across Oklahoma to us, our show and our unique approach to documenting life off the beaten path. So it seemed only fitting that our first stop on a new project would begin with a little known network of trails and backroads... and that rusty bridge over Rock Creek. Our new project is known as Forgotten Highways and our first documentary will be about the historic Ozark Trail. Before Route 66 became America's Main Street there were several private efforts to cobble together cross-country highways. One of these was organized by the Ozark Trail Association and stretched from St Louis, Missouri to Las Vegas, New Mexico. Much of this road would later become Route 66, which has prompted some to call the Ozark Trail the "Mother of the Mother Road." The Trail was marked by unusual stone pyramids. Only seven of these obelisks remain. The story of this road is a uniquely American tale of ingenuity, showmanship and greed that, at times, verges on bizarre. It's a story not many know about, and one that's well worth telling! We are using Kickstarter to fund this project. Kickstarter has been around a few years now and has helped millions of people fund creative projects, unique products and great ideas. The best part is you don't just pledge money. You become part of the project. Normally, these are funded by large companies that hold an interest in the product. Instead, we are letting the people take responsibility for getting it made or not. To show our appreciation we offer you special recognition. Depending the amount you pledge we offer you exclusive content, bonus DVDs or even producer credit. Take a look, share it with your friends, tell everybody you know and pledge now! Two Wheel Oklahoma is a television travel show featuring the motorcycle rides of Brad Mathison and Rex Brown along the scenic highways and backroads of Oklahoma. Each episode highlights a stretch of road or historic route and explores unique destinations along the way. Tune in three times a week on the Cox Channel. We hope you'll come ride along. Two Wheel Oklahoma is a television travel show featuring our motorcycle travels in and around the Sooner State. No matter what you ride- car, bicycle, motorcycle or RV- we invite you to come ride along! Subscribe to email updates. We won't share your address with anyone outside our inner circle. That would be lame. Two Wheel Oklahoma by Rex Brown & Brad Mathison is licensed under a Creative Commons Attribution-NonCommercial-NoDerivs 3.0 Unported License. © 2008-2019 Mathison Inc. Powered by Blogger.